The Finger Lakes were Haudenosaunee/Iroquois homeland and still claimed by the British Crown who only begrudgingly gave up hope of returning after the end of the war of 1812 and the Treaty of Ghent in 1815. The area remained mostly forests scattered with remnants of large Iroquois towns orchards and fields stretching down through the lakes and west through the Genesee Country to the Niagara River. After the Revolutionary war central and western New York became the first truly “wild west” due to the rush of land speculators and pioneers and was rife with with claim disputes, skirmishes, horse thieves, rustlers, bandits, stagecoaches, drunks, religious fanatics and all of the known characteristics now associated with the Wild West. The first frame houses and water powered mills went up in the early 1800’s and the pioneers started homesteading and clearing the lands. The Erie Canal was pushed into this “wilderness” by Dewitt Clinton and the State of New York in the 1820’s and was called by most a vast “folly” at the time it was being built. Into these frontier lands and boom towns came artists of merit. 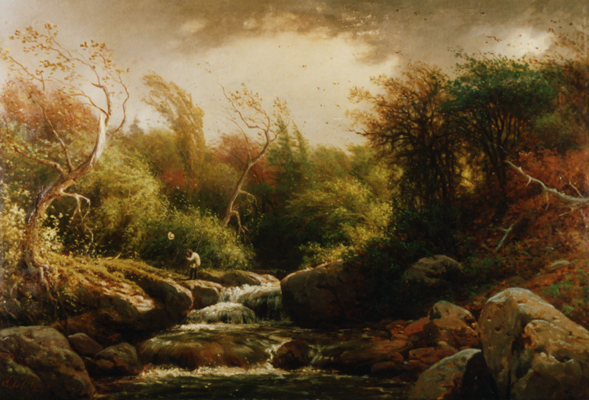 Great artists like Thomas Cole traveled through the area to capture the landscapes before they were completely tamed. 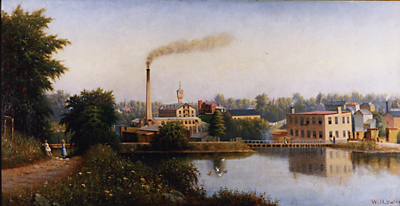 Auburn became the most vibrant of towns and grew into a beautiful and prosperous small city with powerful residents and influences on New York State and American politics. William Henry Seward became Governor of New York, then a leader in the United States Senate, then ran for president, then became Lincoln’s Secretary of State. Charles Loring Elliott was born in 1812 outside of Auburn and lived for a while in the city before moving to Syracuse and then to Skaneateles, only seven miles from Auburn. Elliott worked on his first portrait commissions in Skaneateles and must have also studied with local artists, like Randall Palmer, to hone his skills. Palmer was a competent portrait painter with an elegant style who was living in Auburn and I can only assume he had some influence on the young Elliott who went on to become the nation’s most renowned portrait painter of the mid 19th C.
Elliott’s biography speaks of his returning to Auburn from New York around 1844-45 to paint Seward’s portrait. He borrowed George Clough’s studio for his workshop and home base. Clough is also known to have also been influenced and encouraged by Randall Palmer but Palmer was gone by the time Elliott returned for he had unfortunately died in an accident in 1842. 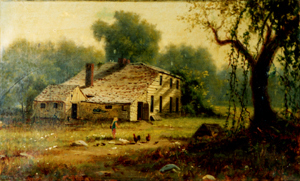 Clough later visited Elliott in New York and eventually moved his studio there but he kept strong ties to Auburn for the rest of his life and retired there for his last years. George L. Clough first pursued portrait painting and and completed many commissions in Auburn. He married a woman from the city and was able to go to Europe to study in the early 1850’s. 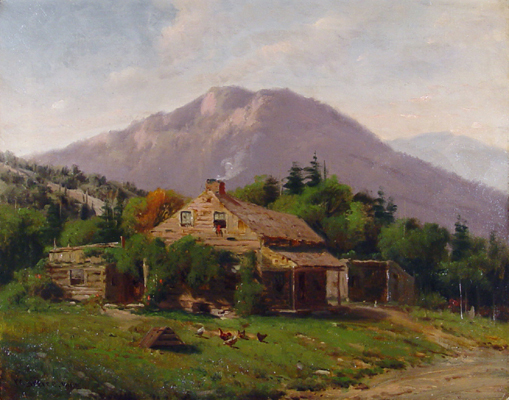 On his return from Europe Clough showed a mastery of landscape painting and spent the remainder of his career at that endeavor becoming a nationally recognized American landscapes painter. Clough painted the local lakes and hills and also campsites and mountain scenes in the Adirondacks a generation before Homer. 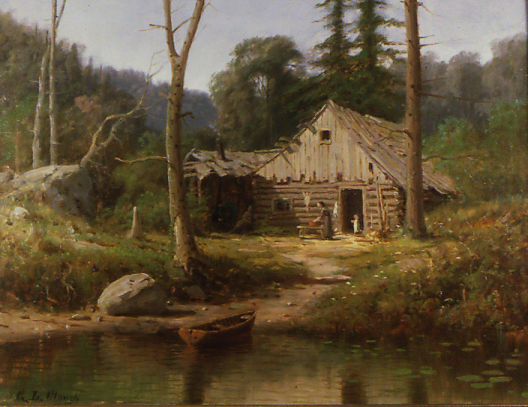 He left many interesting paintings of the Finger Lakes depicting the old mills and homesteads built by the pioneers. 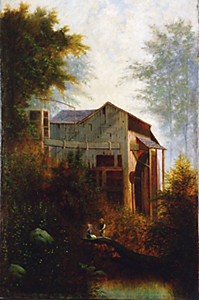 He taught and influenced and taught a whole generation of younger artists that continued to paint in his style for the rest of the century and on into the 20th C.
The group that followed included William Henry Yates, William Bruce, Harry Sunter, George W. King, Charles Parmalee Rising and other lesser known painters. 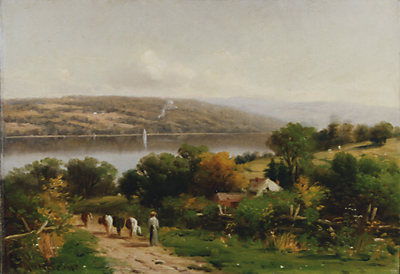 This was quite a competent and prolific group that left a strong body of work in the eastern Finger Lakes and was producing until the end of the first decade of the 20th C. By then most of the landscape artists were gone or retired and the nation’s artistic interests turned to other more “modern” styles born in Paris, London and Berlin. 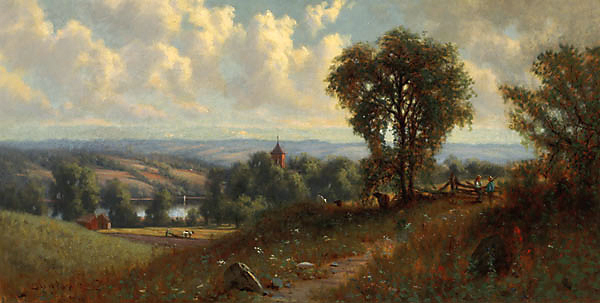 The late 19th C. Auburn landscape artists did have a strong influence on a young Auburnian Frank Barney who studied with Yates and saw the large body of great landscapes left other local artists. Frank Barney went to France to study in 1891 and was smitten by Impressionism and returned to Auburn and became the most prolific and successful American Impressionist of the Finger Lakes. 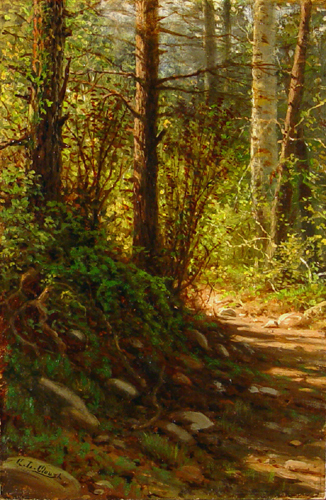 His competent impressionist paintings abound in this area and are a tribute to the beautiful natural landscapes of our area. 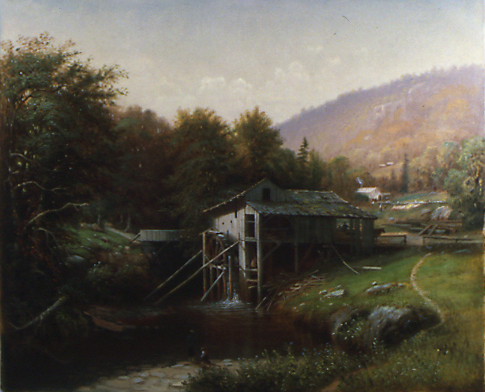 There is a real thread running through our 19th C. landscape artists and you can see it in their work pictured below. 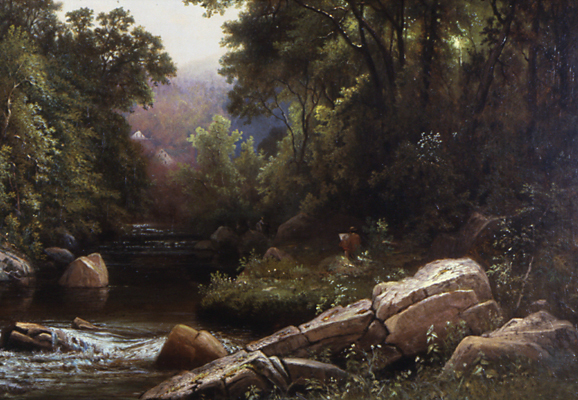 They are a part of the Hudson River School of American Painting and left a strong body of work to contribute to our local history. John Barrow remained kind of separate from the Cayuga County artists next door. Barrow moved to Skaneateles near Auburn in 1839 but spent the next 5 years in England finishing his studies. Barrow may have briefly met Elliott, Palmer and Clough before he left however he only speaks of Elliott in his writings. He must certainly have seen their work. By the time Barrow got back from England only Clough was still around. 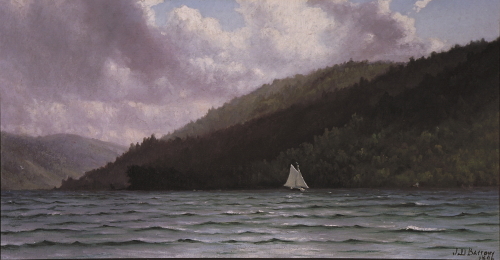 Barrow didn’t join Clough in Auburn but spent the next 10 years in Skaneateles doing a lot of other things – including having a bookstore, sailing up and down the lake, camping and studying geology and practicing sketching with William Beauchamp and E. Reuel Smith. He may have felt intimidated by the more established Clough in Auburn. Barrow left for New York City in 1855. 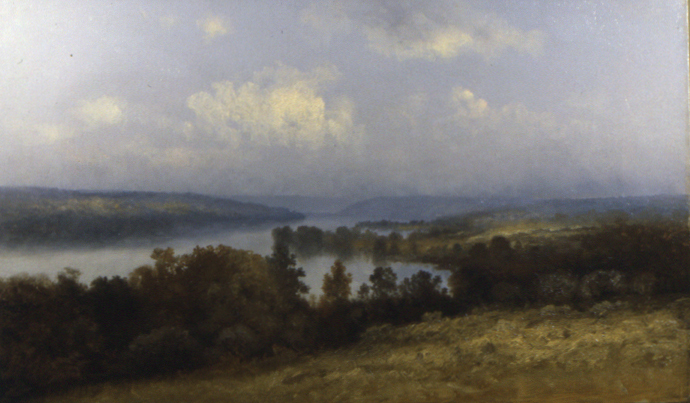 Barrow’s extensive work now exhibited in the Barrow Gallery in Skaneateles shows more of a New York – George Inness influence than anything produced by Clough and the Auburn group of artists.